Researchers at The University of Texas at Arlington have found a correlation between a strong immune response in diseased corals and a lower expression of genes associated with growth and reproduction. "Our findings point to an ecologically relevant potential trade-off, and one which has important implications as we see more coral disease as a result of climate change," said Laura Mydlarz, UTA associate professor and associate chair of biology. "Resilience of species and coral communities may be affected if corals reduce cell growth and reproduction when actively fighting a disease." The research was published this month in Royal Society Open Science as "Transcriptional analyses provide new insight into the late-stage immune response of a diseased Caribbean coral." Mydlarz was senior author. Recent UTA biology doctoral graduate Lauren Fuess was first author. Former UTA biology doctoral graduate Whitney Mann and biology undergraduate Lea Jinks are also co-authors. The researchers analyzed full transcriptomes or expressed genes of three healthy and three diseased specimens of Eunicea calyculata suffering from Eunicea Black Disease. 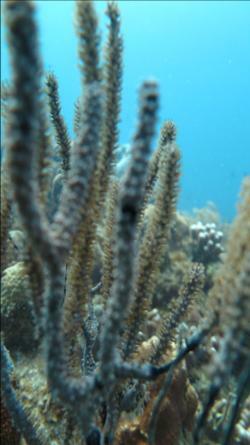 Eunicea Black Disease is easily identified by the dark appearance of affected tissue. The diseased corals showed higher activity among groups of genes that work together around stimulus, immune response and biological adhesion processes, which are often involved in the moving of cells toward a diseased area for immune response. At the same time, there was a lowering of activity of genes associated with cell growth and cell maintenance. "Potential trade-offs during infection may affect post-outbreak recovery of reef ecosystems by reducing growth and reproduction," Mydlarz said. "These findings highlight the importance of considering more than coral death in estimating the effects of disease outbreaks on ecosystems. "We plan to continue the analysis of these samples with an aim to increasing our ability to predict coral community trajectories under increasing pressure from disease and climate change." Future RNA analysis will be carried out at the new North Texas Genome Center housed on the UTA campus, which is bringing massive genome sequencing capabilities to North Texas to support the scientific, academic, medical and biotech communities. "The North Texas Genome Center will be an invaluable resource for our research around coral immunity and genetic response to disease," Mydlarz said. "Having a resource on campus with this capacity is a real game changer." Clay Clark, UTA's chair of biology, congratulated the team on these research discoveries and urged them to continue their efforts in this direction. "It is wonderful to see an all-female team including doctoral graduates and undergraduates participate in a high-impact paper alongside Laura Mydlarz, who is known internationally as a top expert in the field of corals and immune response," Clay said. "This body of work on corals is also clearly linked to UTA's strategic theme of global environmental impact."